Hi everyone! I probably sound like a broken record with how much I go on and on about real estate this and real estate that. Blah blah blah. Well, it’s for a dang good reason – passive income!!! I’m happy to share a guest post today by Angela Pearse from Zumper.com. Check out this quick and insightful read, and let me know in the comments if being a landlord is something you’re willing to try. If not, I won’t be offended, just don’t be mean, k?? Take it away, Angela! With over a third of Americans currently renting rather than owning a home, being a landlord either as a new career (or a side gig) could have big payoffs. It can also give you a whole new set of interpersonal skills that you would never learn at college, or in the workplace. 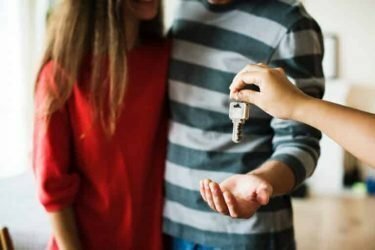 Whether you’ve dabbled in self-managing a rental property before or are thinking of investing in property for the first time, consider the following reasons why becoming a landlord is a good investment, both financially and personally. Buying and holding onto real estate for a number of years to increase equity is a sustainable investment as many homeowners will tell you. But not only does a property have the potential for capital gain, having a credit-worthy tenant to help pay your mortgage creates positive cash flow and generates passive income. Another benefit of being a landlord is that many rental expenses are also tax-deductible allowing you to maximize your rental income. Landlords that choose to self-manage a rental property not only avoid paying a property manager’s fee, they also learn how to pick the right tenant to keep getting those monthly rent checks. Choosing the right tenant is essential, and this is a people skill that you’ll definitely learn being a landlord. You want someone who will look after your property, won’t cause trouble with the neighbors and who will pay their rent consistently, and on time. To protect yourself further from non-payment, property damage and vacant periods, spending a small amount per week on landlord insurance can give you peace of mind. Technology is making self-managing a rental investment easier than ever before. There’s lots of information online from people who have been there and done that so you can get landlord advice firsthand, and even handy tenant screening tools that can help you easily perform credit and criminal checks to choose the right tenant. How you go about advertising for that perfect tenant needn’t be a time-consuming and tedious process either. With a Smartphone or tablet you can post rental adverts, accept online rental applications and schedule viewings on-the-go, it also makes you easily contactable if your tenant needs to go hold of you urgently. A self-managing landlord has to be prompt at responding to their tenant’s calls if something is amiss at the property. This could be a simple fix-it job, such as a tap that’s sprung a leak or a light fixture that needs replacing, but having a local plumber or electrician you can rely on and who won’t charge the earth for a simple job, will be your new best friend on speed dial. A steady, long-term tenant is ideal for generating rental income but once a lease is up, they may decide not to renew. However, this gives you an opportunity to raise your rents in accordance with the market. If you’ve chosen your location and target renter wisely then you can expect rents to increase along with housing prices. This not only gives you capital gain but an increase in positive cashflow. Be aware you may have to spend some cash on getting your property ready for a new tenant before they sign a lease agreement. This could require anything from painting, to checking / replacing appliances, to cleaning and changing the locks. Renting has become the norm after the Financial Crisis, and there is no shortage of people who are looking to rentals as a long-term housing solution. This continuing trend means that becoming a landlord is a viable way to build long-term wealth and security. Yes, buying rental property is a risk, but then so is anything worth doing. Solely relying on social security and 401k income to provide for you in your old age could be actually more risky. Buying a house and having a renter pay off your mortgage is a viable short-term path to long-term wealth, and a good way to diversify your income. So as you can see being a landlord is not only financially rewarding it can also be personally rewarding as it gives you the opportunity to learn new skills and meet all kinds of people. Cubert’s notes: This is just about everything I’ve been preaching since this blog’s inception, nicely distilled in under 900 words. Thanks, Angela! The one note I’d add is that being a good landlord is an asset to the community. With each new rental, we’ve spent money to improve the property, making it more appealing to neighbors, and increasing property values. Sometimes it’s as easy as planting trees, other times you might need to replace a roof. Being a good landlord is profitable, and a great way to support your community too! part of what makes me hesitant are transaction fees for properties like realtor and closing costs. i would rather take my chances with a reit and pay 7 bucks to sell the position when i’m done with it. there’s more than one way to skin a cat, though. i’m glad it’s working out for y’all. Better than REITs, have a look at RealtyShares or RealtyMogul. Being a landlord is a proven way to build wealth. A lot of people make a lot of money with rental properties. I think everyone who has the means should try it. If you don’t like it, you can just sell and cut your losses. I agree totally, Joe. It’s not always easy, and upfront there’s some hard work, but like I preach, just wait until those checks start rolling in. If you run into a wall and have a spell of bad tenants and you just want to get out, be sure to work with your accountant. There’s a fun little thing called depreciation recapture if you choose to sell. I appreciate “landlords”! They offer me the life I really desire. I found that my freedom was not the sh*t I owned (Used to own a house- well me and the bank) – but in having TIME. As a renter now, I have time. Time is most peoples real freedom/ balanced with some cash….I pay for a service by renting. Renting is NOT throwing your money away…its the cost of freedom…So, Is it throwing your money away paying hosting company to host a website??? I mean we can all host our own..you know ….OWN IT…Of course not- you pay for a service- they “rake” in the free money for that…right??? As a renter- Im able able to move w/o a hassle etd…..I also skip down the street care free while my landlords rake in the money!! 🙂 …till the water heater blows up or its time for a new roof. etc…. And, I get it – Ive now been on both sides, including a brief stint as a property manager. in a past life…. I write this to say thank you for “collecting my money” each month. The freedom in peace of mind and my time is worth it! Thanks for sharing your thoughts! I think with anything, you simply have to assess whether a buying or renting a service makes more sense time and energy (and capital) wise, than doing it yourself. I think there might even be instances where leasing makes more sense than buying a car, but you’re talking to a guy who prefers his bike. Ha! I loved renting when I got out of college. It freed up lots of time for other pursuits. But it’s kind of nice have a little extra room for when you have a family and want to have a backyard to play in. Still, if you need to be in a high cost area, it may be wisest to rent vs. plunking down money on an overpriced house. Having “extra” room” for the family is nice indeed—-agreed- totally….just consider that the “extra room” can be TIME instead of money…. always. Ive learned this. We have a nice yard, swings, even a pool a place to run the dog- daily! I am in a high cost area here…so, yes renting is best – and very popular! As far as car goes…haven’t pumped gas in 17 months (just counted) We went car less then…as an experiment . one that we are not looking to end..We bike everywhere. Its utterly amazing living after a life of car centric design…we are in NO hurry to “take” on a car – with it the pain in the a$$ it tails along with it. Re the car – that is AWESOME! What part of the country do you live in, Scott? Biking rules!!! New England. Yes , I bike in winter and snow …. THATS amazing.